Will the Northwest Forest Plan come undone? 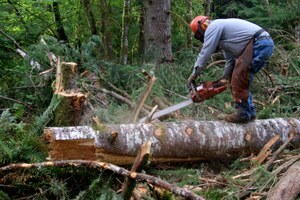 The Forest Service and BLM embark on revising the iconic plan and may allow more logging. If Bonneville Power Administration can't afford to save salmon, it should be gotten rid of entirely. BuRec backs off from water-spreading reforms. A brief guide to groups involved in water-spreading issues. Irrigators are depleting Oregon's Umatilla River. Reporter Kathie Durbin resigns from the Oregonian. Environmentalists use Endangered Species Act to protect Snake River salmon from grazing. Numerous lawsuits attempt to halt logging of old-growth forests. While experts disagree and timber industry pooh-poohs, spotted owl may lose its long fight for survival. Aluminum company owner offers environmental groups money to file suits against commercial fishing. Former Forest Watch colleagues Randal O'Toole and Jeffrey St. Clair at odds. A list of 18 dams Oregon Natural Resources Council would like to see eliminated. Oregon Natural Resources Council wants 18 dams destroyed to save Northwest's salmon. Clinton's Option 9 forest plan draws fire from all sides after the April Forest Summit. A Snake River Chinook Recovery Team plan to truck salmon downstream does more to protect hydropower than fish, critics say. Logging, hydropower and fishing contribute to the decline of salmon in Oregon waters. Governors from Idaho, Washington, California and Oregon ask the President to design a strategy to restore declining salmon runs. Louisiana-Pacific is fined $11.1 million for violating the Clean Air Act. A soon-to-be-released study may recommend dam removal as the best, and perhaps only, way of reviving Chinook salmon in the Elwha River. Is the Northwest ready to live within its forests? A reporter chronicles the events in the Pacific Northwest leading up to the Forest Summit in Oregon.